It's the biggest week of the year for anime news, at least when it comes to the US. It was the weekend of the Anime Expo, when the great and the good gather to discuss all things animated, and announce all the new goodies they have lined up for US customers over the next few months. The way the anime industry works, it could very well be that we in the UK will see some of these titles a little further down the line, so it's worth taking notice. You can see all the announcements in detail at Anime News Network's Anime Expo page. But little tidbits that got me salivating included Funimation nabbing Deadman Wonderland and Steins;Gate, as well as Asobi ni Ikuyo, which they have given the horrendous retitle of Cat Planet Cuties (and fans wonder why people look down on anime!). Viz is finally releasing Professor Layton in the US, after its tremendous success here, and they also have the next Bleach movie, Fade to Black. Manga in their tweets have all but confirmed it for the UK, saying it won't be ready for release here until 2012 at the earliest. Right Stuf, a.k.a. Nozomi Entertainment have announced some choice licence rescues, beginning with the remainder of the Dirty Pair franchise. They released part 1 of Dirty Pair earlier this year, and now they have the rest of the series, the movies, and Dirty Pair Flash. They also have Gasaraki and the Martian Successor Nadesico franchise. Aniplex on the other hand have Madoka Magica and Blue Exorcist. It's also the week that the big players announce their summer season line-ups. Crunchyroll have leapt into action announcing 3 of their 11 titles at the Expo, Natsume Yujincho Season 3, Yuriyuri, and Kamisama Dolls. Bandai Entertainment let another one out of the bag when they mentioned that Sacred Seven would be streaming as well. Anime On Demand has let slip two of their summer titles, including both seasons of Nura: Rise of the Yokai Clan, as well as the noitaminA title, Bunny Drop a.k.a. Usagi Drop. They'll also have more titles to announce over the week ahead. There's also a new player on the world anime-streaming scene. The Japanese site NicoNico is opening up some of its content for English speaking territories, beginning with Blood-C and Uta no Prince sama. They're the anti-Crunchyroll in that their content will stream for free for a week, before disappearing behind a paywall. They have a page up with four other potential titles for summer streaming, but nothing has been confirmed as yet. News from ANN. It's a review rollover… Or rather this time last week, I only had the one review and no news, which would have made for a thin column indeed. That review was for Vampire Knight Guilty: Volume 3 by the way, the penultimate instalment in the handsome moody vampire tale, set in the unconventional high school where vampires and humans are supposed to coexist. I say 'supposed' as at this point in the story, the big bad villain has returned, and he's looking to restore the status quo between vampire and human, or rather hungry and lunch. It's the worst possible time for Yuki to get her memories back, but that's exactly what happens, and it throws the Yuki, Zero, Kaname triangle into chaos. Next up was what may very well be the world's only documentary in anime form. 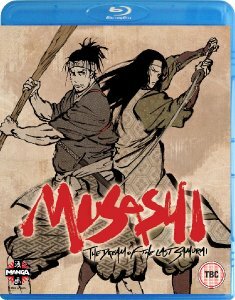 Musashi: The Dream of the Last Samurai relates the history of Miyamoto Musashi, a warrior that made a name for himself at the start of the seventeenth century, and has been a household name in Japan ever since. The thing is that the legend has long since subsumed the facts. Ghost in the Shell director Mamoru Oshii is something of an authority on Musashi, and The Dream of the Last Samurai adapts his screenplay to set the record straight. I got to review the Blu-ray and you can click and see how it fares. 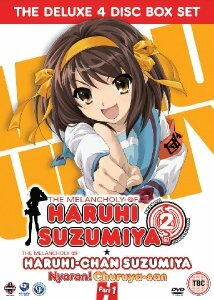 Finally, I realised that it is indeed possible to look forward to, and dread something in equal measure, as The Melancholy of Haruhi Suzumiya: Season 2 finally hits UK shores. I absolutely adore season 1, it's some of the best anime ever made. Season 2 would have always had a hard time living up to that standard, but that was before I saw Endless Eight. Reviewing this collection meant watching Endless Eight again. Depressingly, Endless Eight isn't even the worst of this release's problems. On the other hand, it does have the first part of the delectable Haruhi-chan shorts as an added bonus. 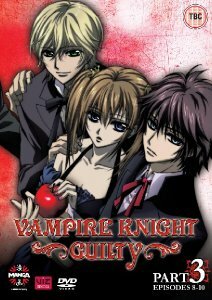 It's all Manga Entertainment, and Vampire Knight Guilty: Volume 3 was released last Monday, 28th June. Musashi: The Dream of the Last Samurai comes out on Blu-ray and DVD today, while The Melancholy of Haruhi Suzumiya: Season 2 is also in shops now. Well it's in a shop now. I mean it's in the warehouses of online retailers now. Stupid Recession!